Bluebird Beginnings? While I have been a photographer of many suits over the years, it was in Spring of 2012 that my camera and I found the bluebirds. It was a pivotal moment, with new beginnings in a few new directions. You can bring the beauty and peace of Nature, as seen in my galleries, to your home or office, or send greetings of peace to others with cards. I am also available for commissioned work to photograph a business or location, as well as work with you to redecorate an office or lobby space. With my camera, I seek to capture the beauty of scenes, wildlife, flowers, and trees. My preference is to be outside whenever I can, especially under a Carolina blue sky! Things that entice and fascinate me: the moon, flowers, buzzing/pollinating insects, mountain landscapes, even city landscapes, oddities of Nature, and more recently, birds. From large hawks to little bluebirds, I love the challenge of capturing their beauty. My childhood years were spent largely in eastern NC, but I also spent about half of many childhood summers in the NC mountains at Camp Yonahlossee, where I learned to love the mountains and Nature. Most of my adult life has been spent in the Virginia mountains, where the Shenandoah Valley offers beautiful mountain vistas and excellent hiking and biking opportunities, as well as an abundance of birds to photograph! Many of my photographs have hidden stories, like the moon over Humpback Rocks. My children were young, and we were returning from a hiking adventure on the gentler backside trails of Humpback, when I saw the full moon. I stopped the car, right in the road, as there was no shoulder. I leaned out the window to take the picture, while the kids were urging me to hurry up before someone came along the road. I do usually try to find a place to get off the road, but this image would not wait and has lasted as one of my favorites. And I can still hear them yelling.... It is also a fun image because the sunset glow on the rocks makes it look like some other place, perhaps Ayers Rock in Australia or something in the Grand Canyon. I enjoy asking people from this area if they recognize where the picture was taken. Most of them guess that it was photographed out West. It makes interesting conversation. 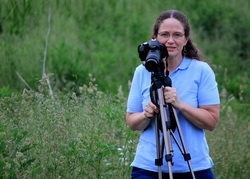 My husband, Mark, is also a photographer, though his interest is portait photography. He helps me a great deal with his expertise and supports me all along the way. Although, he does not get up for my sunrise adventures! I hope you enjoy these images, and that their beauty brings you some sense of peace. If you would like to purchase any of them, visit my products page for details.